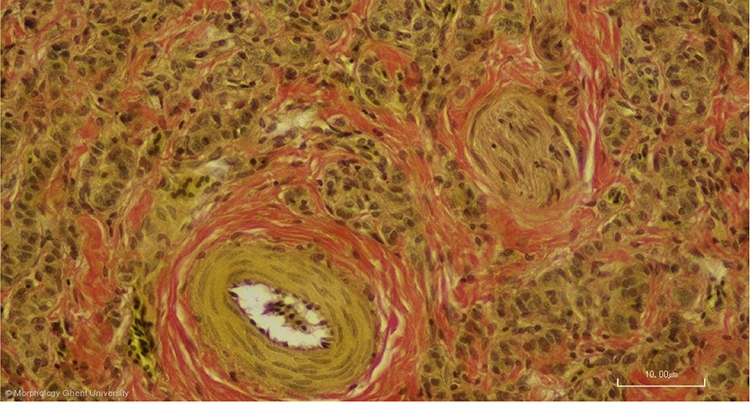 Bundles of myelinated nerve fibers, mainly from the vagus and to a lesser extent from the nervus recurrens and the sympathic system, enter the stroma and give rise to small myelinated and unmyelinated nerve fibers. Incoming arteries derive mainly from the common carotid artery and give rise to numerous capillaries that lie very closely associated with the cords of C cells. Venules and veins drain into a small vein that enters the base of the jugular vein.